Guthrie Participates in Valiant Women Luncheon | Guthrie General, Inc.
Valiant Women is a support group of Mission Hospital united by a common desire to ensure women of all ages receive quality healthcare at our hospital. 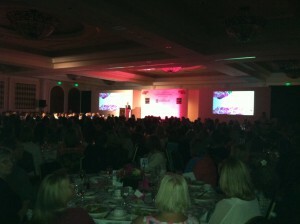 This special group supports the medical, surgical, educational, emotional and spiritual needs of women in our community. Guthrie General was honored to participate in the luncheon held March 21, 2014 at 10:30 am at the St. Regis Monarch. Valiant Women members are a network of generous and inspired friends who believe in the impact of our hospital in the lives of women and families throughout our community. We are passionate supporters that also volunteer to support the mission of our wonderful hospital. In the complex world of medicine, in which the area of greatest need is constantly changing, our fundraising efforts help ensure that doctors, nurses and other caregivers continue to have all the resources they need to perform the miracles that occur each and every day. Knowing we are transforming lives and making a difference, Valiant Women is a vital part of Mission Hospital. Learn more about Valiant Women Here.